Peluso set out to replicate the classic performance and style of Neumann's legendary U47. Could the result be even better than the real thing? Peluso Microphone Lab are American 'boutique' microphone manufacturers who build vintage-style mics by hand, using high-quality components and metalwork. Their current range features several models, many with very familiar-sounding names: the 22251 (after the Telefunken 251), the P12 (AKG's C12), and the 2247 reviewed here. Also included in the product line-up are a ribbon model and a solid-state, small-diaphragm mic, so pretty much all the classic designs are catered for. The 2247 is, in case you hadn't already guessed, modelled directly on the classic Neumann U47 valve mic, which was the first ever switchable-pattern valve condenser microphone and went through several revisions during its lifetime (you can read more about the U47 elsewhere in this article). John Peluso's company is currently offering three versions of the 2247: a basic model and two variations, the Standard Edition (SE) model and the Limited Edition (LE). The LE seems to be about as close a copy of the original as it is possible to get, as it is fitted with a German 'Stahlröhren' Telefunken 'Steel Tube' VF14-equivalent valve, whereas the SE model uses an American Steel Tube equivalent, the 5693/6SJ7. While the former is, arguably, more 'authentic', it is noisier, and the latter uses a more easily available valve and is quieter. Both are metal-cased valves, rather than the more familiar glass-tubed designs. 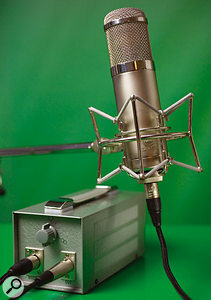 The third version of the mic is based on a modification of the original U47 design (introduced by the German radio broadcasters in the 1970s), in which the original VF14 pentode was apparently replaced with a glass triode valve, and the noise-floor improved as a result. This version of the 2247 apparently uses the 6072A dual-triode valve, which endows it with a self-noise figure of 12dBA — that's 3dB less than the original U47. Another variation on the original theme is that only two polar patterns were provided on the U47: omni and cardioid. Each of the Peluso 2247 versions offers nine different polar patterns, controlled by a rotary switch on the power supply, ranging from omni, through cardioid and on to figure of eight. Other than those small differences, the 2247 looks the part, and is very well presented. The mic is supplied in a nice, foam-lined wooden box, along with an elastic spider shockmount (the classic Neumann design). The power supply is modelled to look very similar to vintage units, with a 'hammered', gunmetal-grey paint finish, and vintage-style toggle switches and knobs. Although the mic is marketed as being hand-built in America, it seems that these are largely Chinese parts. The fake Neutrik connectors on the seven-pin cable, carrying the 'Legun' name, are an obvious clue, but so too is the engineering of the metalwork. However, the Chinese have quickly become very skilled microphone-capsule manufacturers, so I wouldn't necessarily hold the source of the components up as a black mark, and Peluso have a fine reputation and a considerable amount of experience in repairing and reworking vintage microphones and capsules — so they should know how to build an accurate-sounding replica! The whole 2247 SE kit (the mic in its wooden case, the shockmount, the connecting cable and the power supply) is contained within a sturdy flightcase. The only thing missing (from the review sample, at least) was some sort of manual and specification sheet. However, there was a quality-control-style frequency-response printout, showing an astonishing flat line between 40Hz and 10kHz, with a gentle droop above that. The scale of the graph is such that small level variations are impossible to see, but there appears to be a modest scoop of a few dB stretching between about 500Hz and 3kHz. Surfing over to the Peluso website, I managed to find a complete set of specifications for the Limited Edition model. Sensitivity, at 12mV/Pa, is a little low compared with modern capacitor mics, but I doubt that will cause problems for anyone. Self-noise for the German Stahlröhren tube model is is 16dBA (fractionally higher than the original U47), while the American-tubed version boasts a self-noise of 14dBA. Maximum SPL is given as 140dB (but without any indication of how much distortion occurs at that level). The body of the mic can be removed easily by unscrewing the base, to reveal the electronics. The circuitry is very simple, but good-quality components are used throughout. The specifications claim the valve should be a 5696/6SJ7 pentode, but the markings on the side of the black metal case (which, to be fair, were very hard to read) appeared to be 6KX8. If so, this is a dual-triode variation of the ECC808 — essentially a low-noise version of the more familiar ECC83/12AX7. The modest circuit board is marked as a Rev 3 version, and the output transformer is neatly encased at the bottom of the mic's structure, with the integral seven-pin output XLR (the originals had 6-pin connectors because a separate heater supply wasn't needed). The capsule is a 34mm gold-sputtered design, but the diaphragm material is not specified. The SE and LE variations of the microphone have dimensions of 58 x 235mm and each weighs 855 grams. The basic model is slightly shorter, at 200mm, and weighs a little less as a result (775g). The initial U47 model was launched by Neumann in 1949, and it employed the infamous M7 capsule (a design which dates back to 1930), along with the VF14 pentode valve (although operated as a triode). In 1955 the U47P model was produced, with a 'torpedo head' for the newer, aluminium-diaphragm M48 capsule, and then the U47N version was introduced, with a 13CW4 Nuvistor instead of the VF14. The last sounded slightly different, and the valve had a much shorter life span than the VF14 because it got too hot. Part of the problem with finding a suitable valve replacement was that the original power supply provided only 105V (for both the anode voltage and the heater supply, via a dropper resistor that produced a lot of heat). The VF14 is impossible to find these days, but the EF14/UF42 version, which can still be found, can apparently be used with a very minor modification to the heater supply. Other valves can be used too, but they all involve modifications to the power supply to provide a separate heater voltage. By the mid 1960s, the U47 had switched to the K49 capsule, which had a polyester diaphragm instead of the original's PVC design. The PVC material degrades over time to make the diaphragm very stiff and brittle, and the mic becomes considerably brighter as a result. Right from the early days of Neumann after the war, Telefunken were appointed to distribute the microphones worldwide, with the Telefunken logo in place of the Neumann badge. It may seem an odd arrangement, but actually it was a smart move, as it allowed Neumann to avoid paying royalties to Telefunken over patents in vacuum-tube technology (the VF14 was a Telefunken valve). However, as a result Frank Sinatra famously always referred to his Neumann U47 as a 'Telly', and few Americans realised who the real manufacturers of this famous mic were! In its day, the U47 had phenomenal specifications and really set the standard — a standard which a surprising number of modern mics fail to match. To test the 2247, I deliberately chose to use my TRP preamp. This was designed to accompany AEA's ribbon mics, and one of its claims to fame is an astonishingly low noise floor and utter sonic transparency — it adds, quite literally, nothing other than gain, and takes nothing away. Of course, it doesn't provide phantom power, so it can't be used with most capacitor mics, but since valve mics have their own power supplies anyway, it makes an ideal partner for them. I mainly used the 2247 to record vocals (both male and female), since I imagine this is what the vast majority of people will use it for. However, I was also able to use it to record acoustic guitar (a gorgeous Lowden), cello and saxophone. The mic delivers a lovely, clean, airy sound: there is certainly no obvious lack of top end but, equally, there is no harshness or falseness there either. So many capacitor mics seem to deliver an excess of high frequencies, often tainted by a kind of resonance that can grate over time. The 2247 retains the typical vintage character that provides enough brightness but without overdoing it — similar to a good ribbon in many ways, only more so. The real strength, though, is in the mid-band, which seems warm and fulsome, but doesn't cloud the transient response higher up the range. The bass end is worthy of praise, too — smooth, detailed and solid, but not too overpowering, and well-balanced in relation to everything else. I have been fortunate enough to use genuine U47s in the past and, like most of the classic Neumann mics, they have the ability to work perfectly in a mix right from the off. So many mics can sound brilliant when soloed, but seem to need work with the EQ controls to help them fight their way to the front in a mix. The 2247 shared that same quality, and I just didn't feel the need to fiddle with the EQ when using this mic, not even on the acoustic guitar. Strangely, I also found that I used less compression on the vocals than I normally would have expected. This mic just seems able to produce 90 percent of the 'right sound' straight out of its XLR socket. I wasn't able to compare the 2247 directly against a real U47, and it has been a while since I have used one myself. However, the Peluso mic seems to have the same general characteristics that I remember of U47s of old, including the ease of use and full, rich, bigger-than-life sound. More to the point, perhaps, it sounds fantastic anyway, regardless of whether it is a sonic match for the U47 or not! On the saxophone, it produced a rich, full-bodied sound, with plenty of detail and life, and no complaints about the SPL produced close to the bell. The cello sounded warm and sonorous, with lots of wood and rosin, and I find it hard to find any real fault with this mic at all. It's not even that fussy about placement, although it obviously pays to take the trouble to find the sweet spot of the instrument. If I had to be picky, I could complain that it is fractionally noisier than the best of modern designs. But being realistic, the noise floor is no worse than most high-end small-diaphragm mics, and you wouldn't notice it in any practical application anyway — this isn't a mic intended for distant placement, after all. At over £1300 in the UK, the 2247 SE is an expensive microphone, competing with some of the very best that money can buy: classics like the DPA 4011, for example, as well as the Neumann M147, the TLM 170R and the U87ai. However, it can hold its head up high in this company and, arguably, will deliver a better sound — maybe not technically, but sonically and artistically. It doesn't have the 'edge' that many modern Neumanns seem to have, but still retains the clarity, detail and warmth that is needed. In that context, the price is easily justified, and if you can argue a compelling case to invest this kind of money in a versatile top-end mic then the 2247 SE should be on your list of suspects. The basic (shorter) version mentioned earlier is about £400 less expensive, with slightly better technical specifications and the same sonic characteristics, but it is 'less accurate' as a replica U47 because it uses a different type of valve for its impedance converter. Again, it is still very much worth an audition! There are a number of U47 clones around, but in terms of modern microphones at a similar price, the 2247 can be compared to the likes of the Blue Mouse, the DPA 4011 or 4006, or three Neumann classics: the excellent TLM170R, the U87ai and the M147. Only the last is a valve microphone, of course: the M147 is the direct descendant of the original U47. Taking a more lateral approach, AEA offer a very attractive package combination of an R84 ribbon and TRP preamp, costing only a little more than the 2247 SE. That could be a serious temptation if you don't already have top-flight preamps available. Classic U47 styling and vintage-looking power supply. Immense 'presence' in the studio. Supplied as a full kit with shockmount, in a flightcase. True U47 sonic characteristics, including a larger-than-life sound. Higher output than a real U47, and slightly quieter too. The Peluso 2247 is a remake of the classic Neumann U47, retaining all the desirable sonic qualities of the latter but extending the versatility with nine switchable polar patterns instead of just two. Available in three different versions, each of which uses a different valve. 2247 SE £1349 including VAT. Soundpure LLC +44 (0)207 096 3919.